Evening things out: Leo Gomez wasn't a big name, but he sure had a big chin. In Hollywood, this size of chin is revered. In baseball, it can prove detrimental, which it did for Gomez, whose batting average dropped with every millimeter his chin grew. The bigger the hole in his chin, the bigger the hole in his swing. Gomez knew he had to do something. But how to even out the weight from the 12-pound chin constantly pulling on the rest of his face? How about a 12-pound pair of face shields that came with a free squeegee. The glasses Gomez chose were so big they needed a reinforcement bar across the top of the frames. The glasses came with a third, mini lens between the two massive lenses, which each once served as golf cart windshields. And the nose pads? Gomez could have used them as snowshoes in the winter. 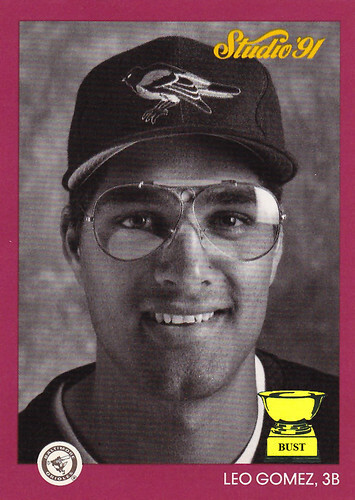 Despite their size, Gomez wore the glasses during every game. They evened out the weight distribution on his face, counteracting the pull of the action star chin. But his batting average? It stayed so small you could barely see it.